A little over two years ago, I moved from NYC down to Baltimore. The added free time and accessibility of a practice space meant I could practice in a more thorough, general way rather than feeling trapped in a perpetual whirlwind of learning new music for the next gig. Around this time I also began working with a powerlifting coach who took the specificity of how I was training in the gym up a few notches. I’ve adopted some of these training methodologies into how I practice music. For those unfamiliar with powerlifting, you’re training three specific lifts: the squat, the bench, and the deadlift. These lifts are all “compound” lifts meaning they work several muscle groups simultaneously. The squat primarily uses your legs, back, and core, the bench uses your chest and arms, and the deadlift uses your back, legs, and forearms. In training sessions with my coach, we would push towards the heaviest weight I could lift once, or a “One Rep Max.” When the weight got too heavy, my technique would break down at a certain point due to weakness in a certain area. For example: my coach noticed that my weak triceps were holding back my bench progress when I would fail halfway through the movement. She then instructed me to supplement my bench day workouts with a closer grip bench as well as tricep pushdowns. On the deadlift, I was failing at the lockout (the last few inches of the movement). My coach had me do rack pulls (similar to starting a deadlift from halfway through the movement). Due to this planning and specific training, I began making rapid progress after remaining stagnant for almost a full year prior. This judicious use of assistance exercises which focused on particular muscle groups helped me progress at a faster rate than I would have had I only been using compound lifts in training. 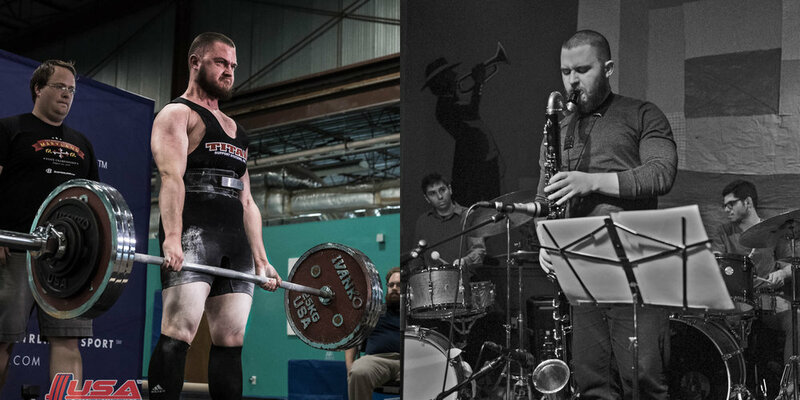 Just like each compound lift is made up of several muscle groups, an improvised musical performance has various parallel focuses. A complete musician has great ear training, rhythm, understanding of melody and harmony, as well as command of their instrument. To find the weak points in my playing, I sought out teachers who gave me honest and critical feedback on my musicianship. After these teachers pointed out my weaknesses, I knew what I had to work on. Just like certain physical exercises strengthen certain muscles, I designed my own exercises to target specific aspects of my musicianship. For example, when a teacher said I should work on intonation, I practiced exercises that involved playing along to a drone. To help me focus on the intonation aspect of the exercise, I turned off the metronome to take rhythm out of the equation. When another teacher told me I needed to be able to feel triplet subdivisions more naturally and across the beat, I started practicing exercises in triplets, varying the note groupings, and articulating every one, two, or three notes. Due to the challenging rhythmic nature of this at first, I had to choose sequences of notes I was already familiar with so my facility on the saxophone wouldn't hold me back. Just like doing a close grip bench or rack pull in the gym, as much as I was adding emphasis in a certain area, I would take away from another. I know this isn’t groundbreaking, but from my experience in musical academia, which tends to put a focus on learning harmonic material over everything else, it was refreshing to realize one pattern can be practiced in a variety of ways to improve specific aspects of my musicianship other than just generally trying to play faster, more complicated stuff. It is common to practice a sequence of notes in all 12 keys, so why not take the same sequence of notes and change the change the rate, articulation, or note groupings? (drummers: I know you’re rolling your eyes right now) Why not alter the interval content, invert the pattern, or put it in retrograde? Just like practicing in 12 keys lets you apply new language over different tunes quickly, changing the rates, accents, etc. adds the freedom to play in a more improvisational way. Rather than learning new language as a “lick” and playing an exact sequence of notes starting on beat one, I practice in different variations with the goal of becoming free to react to what the rest of the band is playing. In some ways, I think of new material to be added to my playing as a theme to vary rather than a simple pattern. How do you structure your practice? What about your workouts? Am I drawing too many false equivalencies? Let me know by leaving a comment below.